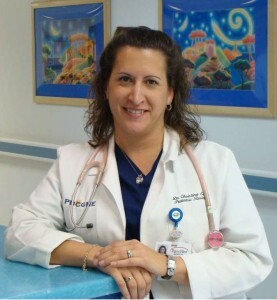 Loxahatchee, Florida, June 22, 2009– Palms West Hospital, in partnership with The Palm Beach Centre for Graduate Medical Education, is proud to announce the graduation of Dr. Christina Ecker, our first Pediatrician to complete the Pediatric Residency program. Shamaskin, Pediatric Center of Wellington. Dr. Ecker is looking forward to practicing medicine in the Western Communities, where she trained and currently lives. She has built many relationships with the local attending physicians and looks forward to working closer with them. Dr. Ecker lives in Royal Palm Beach with her husband and two children. She is thankful to her family for all the support and love they have given her during her three-year residency. “I would like to thank all of the attending physicians who were involved in my training, as well as my fellow residents and the Palms West Hospital staff who have supported me both personally and professionally throughout my training. It has been a long journey and as I close this chapter in my life I look forward to my future as a pediatrician serving the growing pediatric population of the Western Communities”, said Dr. Ecker. “We are proud of Dr. Ecker’s accomplishments during the course of her training and excited that she will practice in the local community and join the staff of our hospital. We are also impressed with Dr. Ecker’s performance on her board-certification exam, in keeping with PBCGME’s remarkable 100% first-time pass rate for all of our resident graduates”, said Dr. Brad Feuer, Regional Director of Medical Education for PBCGME. Being among the first residents in the program, Dr. Ecker feels she paved the way for those who followed her in the program. She is glad to see how the program has grown and takes pride in knowing she was part of the process. Her involvement with the PBCGME program at Palms West Hospital does not end here, Dr. Ecker says she will continue to be involved with the program as an instructor. The Palm Beach Centre for Graduate Medical Education is a multi-facility academic medial center with 96 accredited residency positions in eight different programs. Our facilities currently include Columbia Hospital (sponsor), Palms West Hospital, St. Lucie Medical Center and Northwest Medical Center. Previous articleJuly/August, 2009 – A Wonderful Summer!